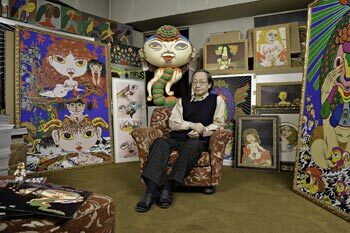 Nanzuka Underground is pleased to present a solo exhibition by Keiichi Tanaami (1936-). In contrast to the print art which he has set as a main battlefield for the presentation of his works, for this exhibition, Tanaami has produced new works in painting, drawing and sculpture. Keiichi Tanaami started his career as an artist in the late 1950s and became famous for his distinctly pop illustrations and designs from the 60s to the 70s. Having been associated with Andy Warhol and Jasper Jones, and designed the album jacket of “The Monkees”, his works have been highly valued internationally since then. In recent years, the reputation of his works keeps rising, involving new generations. In August 2007, his work made the cover of “Wallpaper”(world wide style magazine from UK). This exhibition titled “DAYDREAM” will include works that are focused on goldfish and young girls as the newest form of Keiichi Tanaami who has always embodied the frontier of culture. During the term of the exhibition, there will be a talk event with Tabaimo and a screening of his video works that have been selected for many international film festivals including previously unseen work. In addition, a book of paintings titled “DAYDREAM” (graphic-sha) will be published in a catalogue of this exhibition. 10.26Fri, 2007 19:00 The artist will attend the reception. 8 more works are planned to be screened.